Tanzania is in eastern Africa, just below Uganda and Kenya, and on the Indian Ocean. At the end of our eleven day/ten-night Zambia safari, we flew from Livingston to Johannesburg for an overnight stay. The next day we flew to Arusha, Tanzania via Nairobi. Arriving at Arusha Coffee Lodge at around 8 pm, we spent two nights (one full day) relaxing there before our next adventure. On the morning of 28 August 2014, our guide and driver, Nelson, picked us up at ACL in his 4x4 Toyota Land Cruiser for the trip to Ngorongoro Crater. After three nights and two full days in the Crater while staying at Lemala Ngorongoro Camp, we flew by Coastal bush plane out of Manyara Airstrip to Kogatende Airstrip for four nights at Sayari Mara Camp in the remote NW corner of the Serengeti near the Mara River and the Kenyan border. Albert Alfred Lucas was our guide and driver. All arrangements for our requested Tanzanian safari from our arrival at ACL through our return to Arusha and departure from ACL on 5 September 2014 were made by Africa Travel Resource. All photos are Copyright 2014 Larry Lenon All Rights Reserved and show a faint watermark. THE WATERMARK WILL NOT APPEAR ON PRINTS, MERCHANDISE OR DOWNLOADS ORDERED THRU SMUGMUG. Questions ? Critique ? Add a comment (lower left) or e-mail me! 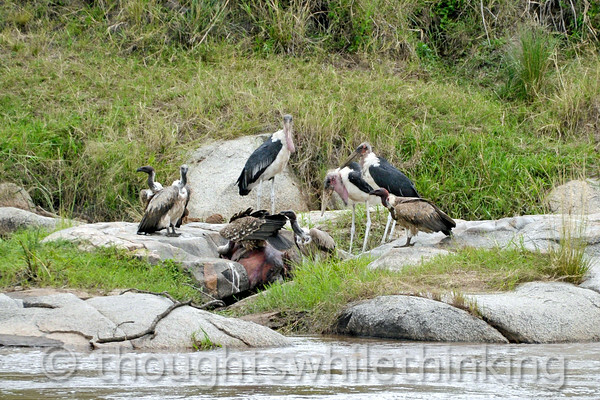 Marabou Storks and vultures clean up a carcass. The pecking order here is the somewhat combative vultures first and then the storks.